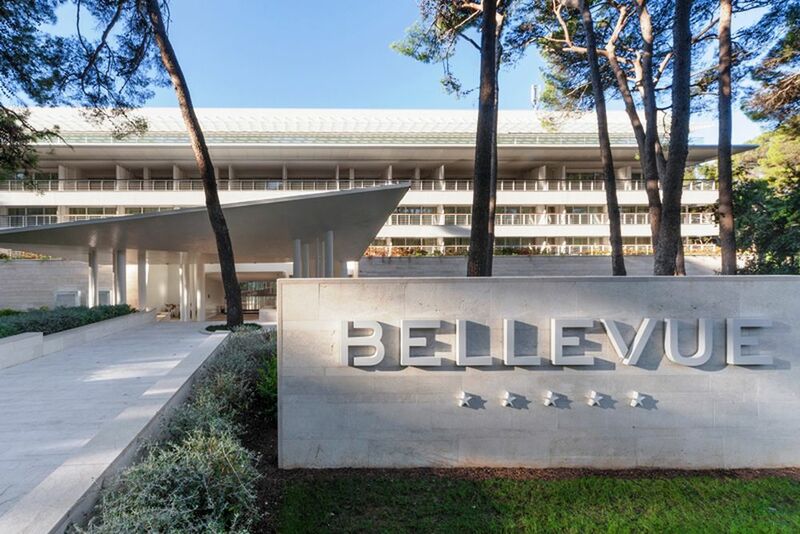 Surrounded by the green pine forest, the five-star Hotel Bellevue is located in a quiet environment. Bright and open design gives the hotel its pleasant feel-good atmosphere. Clear water and colorful fish just steps from the hotel. On the plateau, there are loungers ready for you. The quiet promenade is lined with pleasantly shady trees. The hotel's large outdoor pool offers plenty of space for sunbathing. From the balcony, you have a beautiful view of the well-kept grounds of the hotel. Cozy seating offers a place to relax, especially for the beautiful sunset at dusk. Enjoy the soothing view of Cikat Bay with its beautiful scenery. Especially in the evening or in the morning, the promenade invites for long walks. 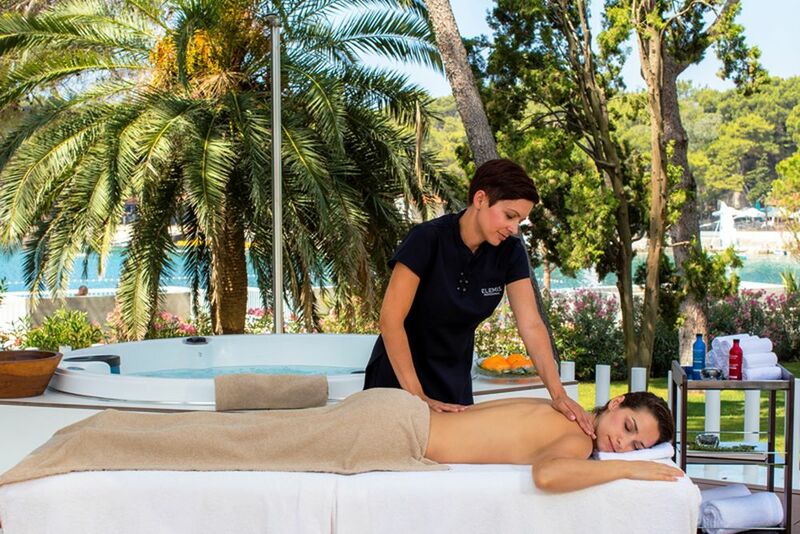 A massage in the middle of the quiet garden - here you can completely relax. Stylish and simple - the Bellevue attaches great importance to small details. An incomparable view of the blue sea and the bay. Bright colors and pleasant contrasts create a luxurious and comfortable atmosphere. The noble bathrooms feature Natura Bissè cosmetics. With such a view in the morning, getting up is much easier. Each of the rooms is individually designed and offers a lot of comfort. Dining in a Pleasant Atmosphere - In the hotel's restaurants, you can enjoy traditional dishes that are skilfully combined with international cuisine. 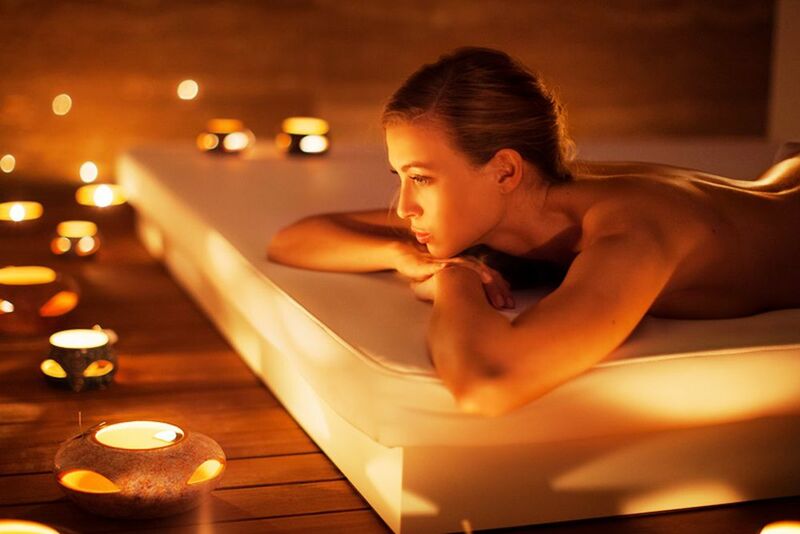 Relaxation and revitalization are in the foreground of the spa area of ​​the hotel. 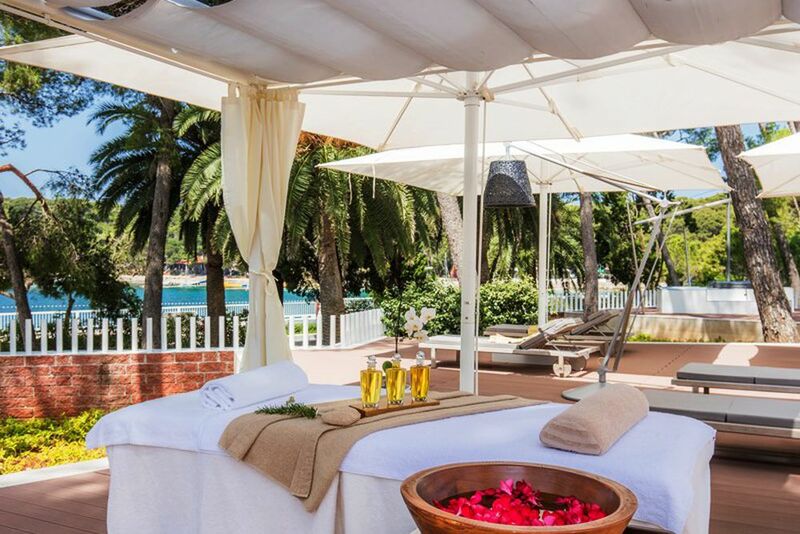 Personalized massages and therapies ensure that you can enjoy a truly relaxing holiday. Nothing but a light breeze and the pleasant sounds of the pine forest accompany you during the massage. The treatment rooms of the spa area are a true oasis of tranquility with pleasant scents and sounds. Let yourself be pampered - The therapists are trained and tailor the treatment to your needs. 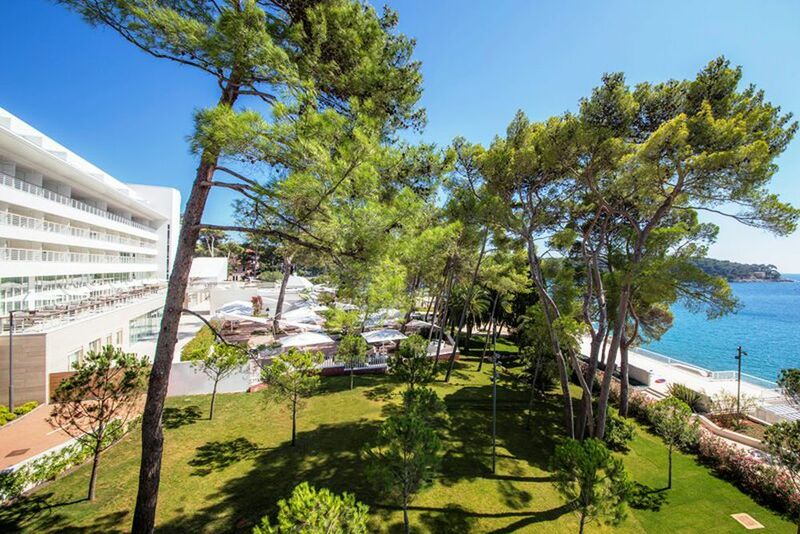 Under the canopy of a century-old pine forest and located directly on the glistening sea, is one of the most intimate and most beautiful coves on Lošinj, Hotel Bellevue. Recently renovated, it offers sophisticated comfort for a luxury 5-star dream vacation. Numerous carefully crafted details, first-class hospitality, and a unique service concept promise carefree relaxation. 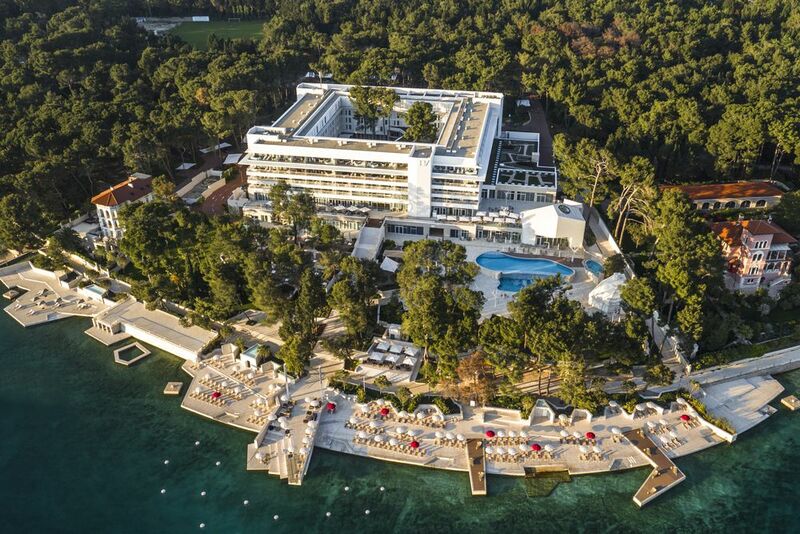 Just a few steps from the crystal-clear sea, this superb, intimate location is Lošinj’s first luxurious 5-star hotel. 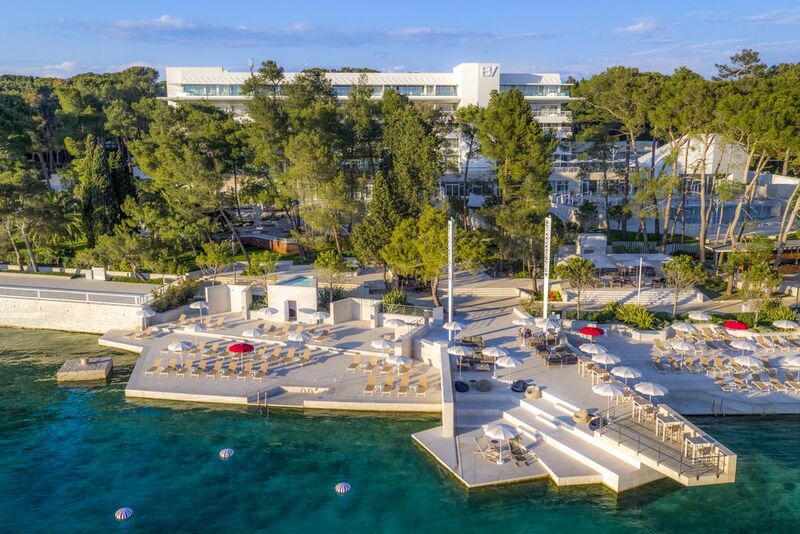 Its architecture dates from 1966, but has been newly renovated into a dream destination. 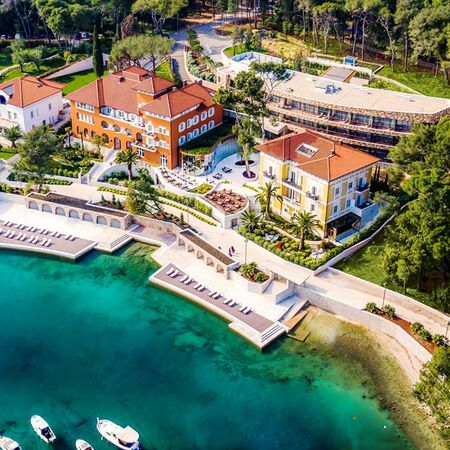 Hidden in the midst of a fragrant pine forest, Lošinj is tucked away in Cikat bay and known for its tranquil fishing villages and crystal-clear sea. 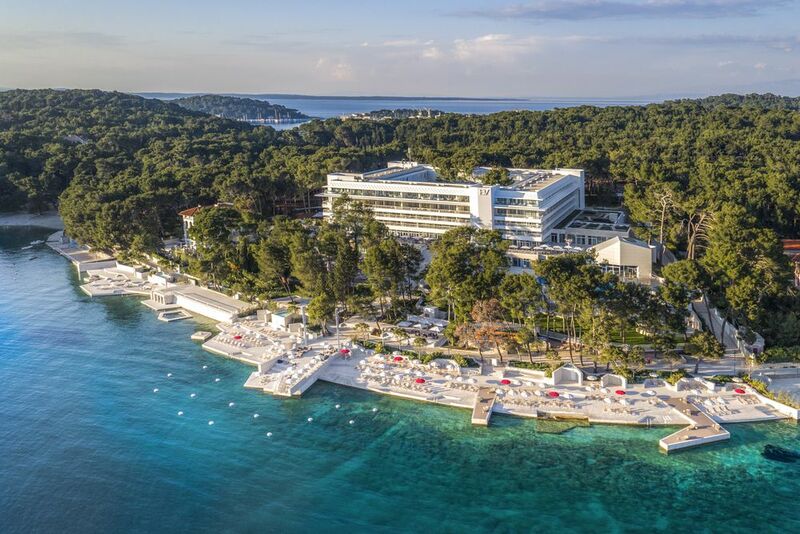 Lošinj is appreciated for its great heritage, unique, subtropical climate and fragrant nature with healing properties of revitalization and relaxation. The airport of Rijeka can be reached by car and the ferry in about two hours. The chefs, luxuriously furnished restaurants and bars welcome and invite you to an unforgettable gourmet experience. At Pin and Oil, traditional cuisine meets modern accents in a perfect combination. Various dishes, typical of the mainland and coast, are prepared exclusively with fresh, local vegetables, fresh noodles and fragrant herbs from their own garden. Absolutely recommended are the imaginative desserts, prepared with fresh and dried fruit, olive oil and truffles. Wake up your taste buds with scrumptious flavors from the Bava Restaurant. Freshly baked rolls and pancakes call your name! In the evening, experience an elegant ambience in the beautiful atmosphere. Every evening, there is a new surprise here as dishes from a different place are always served. The Lounge Bar Alto Rosso savors your taste buds with light dishes available in the daytime. On the terrace overlooking the vast sea or verdant atrium, you can enjoy a selection of sweet and hearty appetizers. 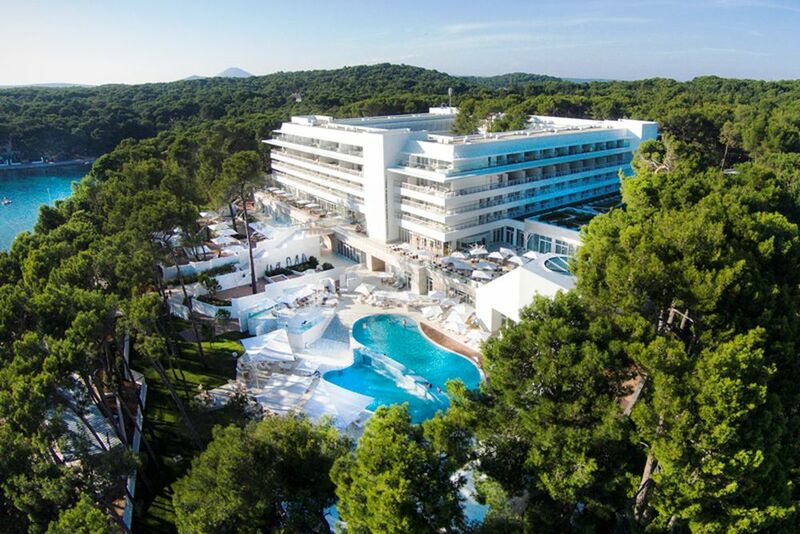 The Pool Bar Azzur offers excellent drinks and light snacks under the warm, blue skies and fragrant pine trees. 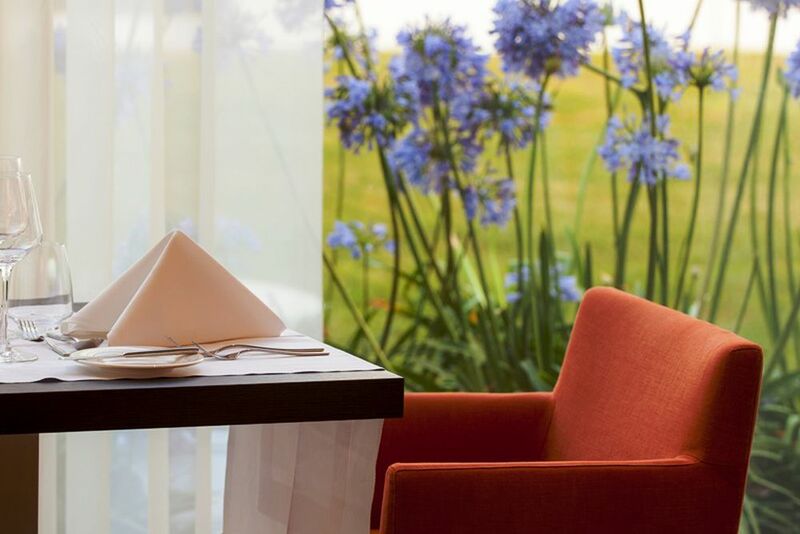 Benefit from the "Dine Around" concept of the hotel group when booking the dinner surcharge, and enjoy access to the à la carte restaurants of the sister hotels. 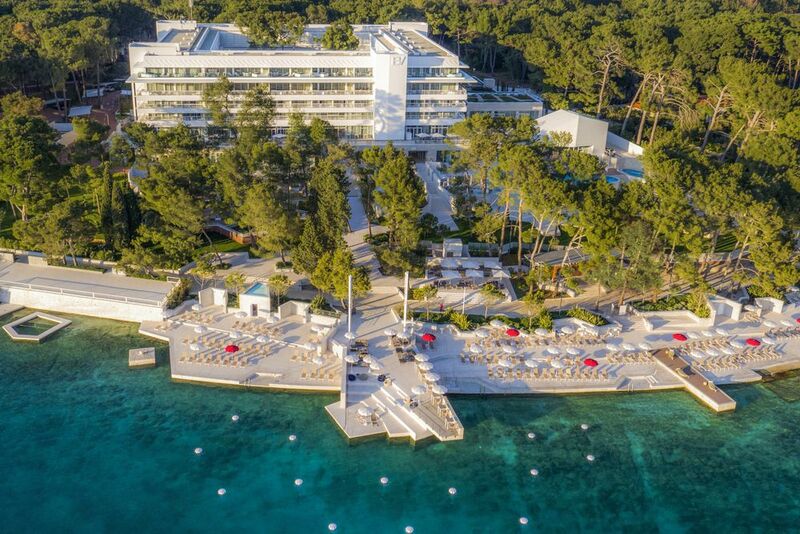 The hotel offers other facilities such as boutiques, souvenir and newsagents, a hairdressing salon, concierge service, currency exchange and supervised parking. 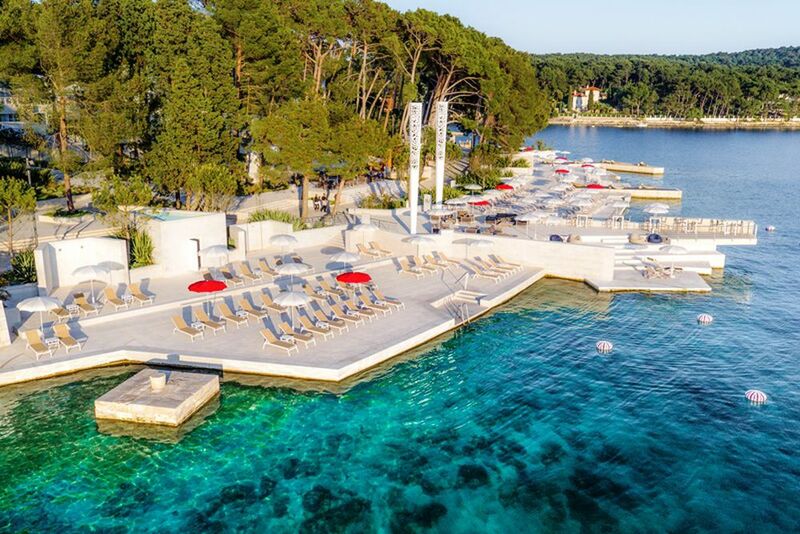 Croatia is known for its rocky beaches and crystal clear waters. In order to reach the water pleasantly, a sunbathing area of ​​light stone has arisen over the water, which, thanks to steps, facilitates the walk into the cool water. Beach and pool towels are free. The 185 rooms and 21 suites are divided into eight categories, providing an ideally wide catalog for all tastes and needs. All rooms have air conditioning, a telephone, bathroom floor heating, LED HD television with satellite channels, coffee and tea making facilities, safe and complimentary Wi-Fi. The combination of carpet and parquet floor gives the rooms their noble charm. Toiletries by Natura Bissè are available in all categories. Superior Atrium Room - ca. 25 m² living space, this room overlooks the perfect scenery of the relaxing pinewoods, romantic hotel atrium or deep blue sea. 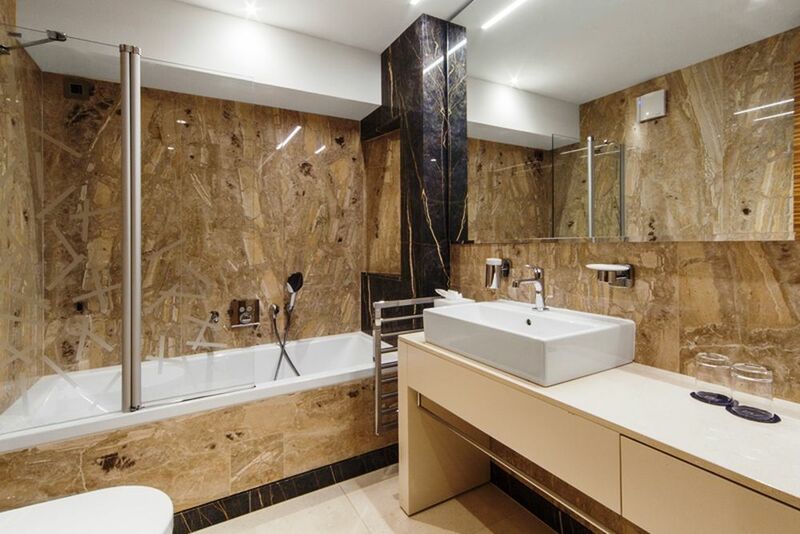 The bathroom includes a bathtub, hair dryer and superb toiletries for relaxation. Maximum of 2 adults. Superior Room - ca. 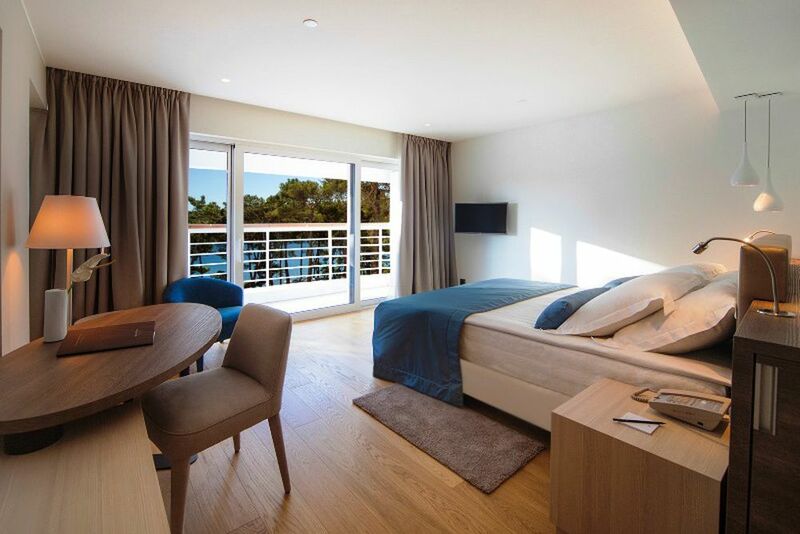 28 m² living space + 8-12 m², the double rooms with view of the sea or the bay have a bathroom with sink and hair dryer. On request, rooms are available in this category which are suitable for guests with reduced or restricted mobility. Maximum 2 adults. Executive Suite - ca. 75 m² living area and a 45-35 square meter terrace divides into a double room, living room and two bathrooms, creating enough space for you and your partner. The bathroom has two sinks, a bidet and a hair dryer. 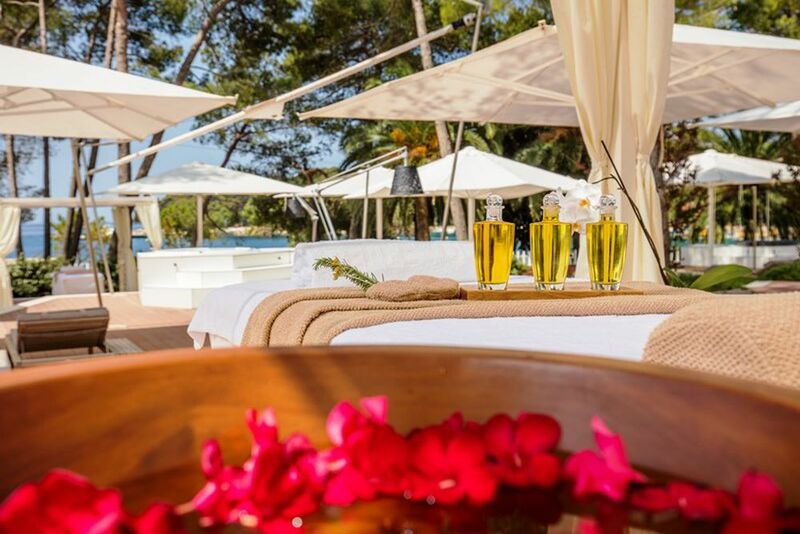 On the terrace, next to a Jacuzzi, sunbathing and a sitting set are available for you. Maximum of 4 adults. Bellevue Suite - ca. 93 m² living area and 52-57 square meter terrace divides into two double rooms with two separate entrances, a common living room, two bathrooms, and a walk-in closet. The bathroom has two sinks, a bidet and hair dryer. On the terrace, there is a Jacuzzi and a sunbathing sitting set. Maximum of 6 adults. Luxury Suite - ca. 113 m² living area and 67-80 square meter terrace, this suite includes two double rooms with two separate entrances promising privacy even if you travel with several people. A living room, three bathrooms and a walk-in wardrobe for your every need. In addition to a shower and bathtub, there is also a double sink, a bidet and hair dryer in the bathrooms. 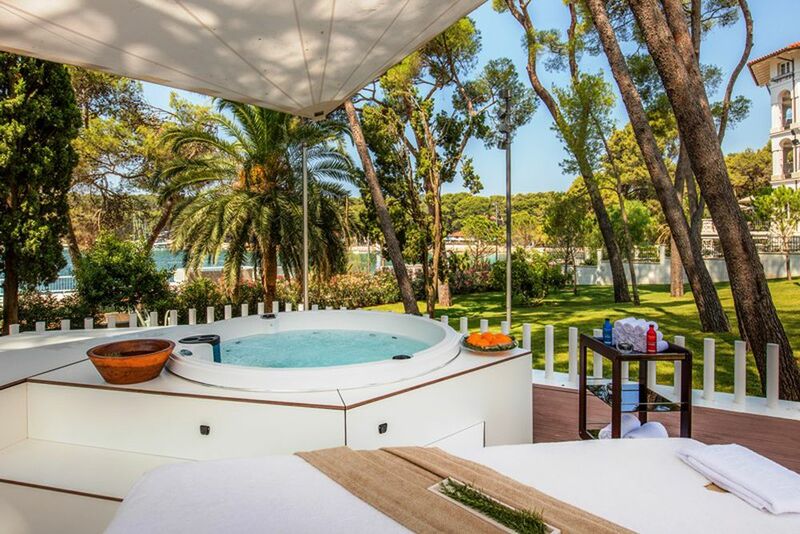 Find a Jacuzzi and a sunbathing sitting set on the terrace. Maximum of 6 adults. 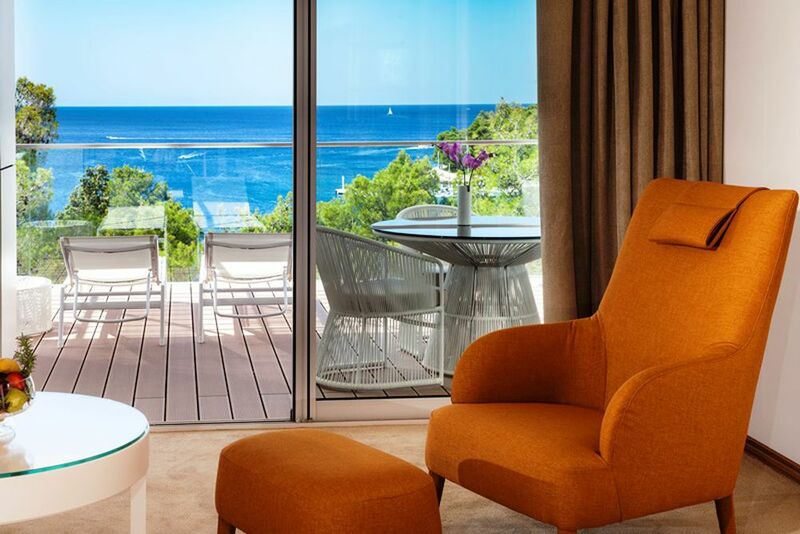 Presidential Suite - ca.185 m² living area and 119 square meter terrace, this suite is the largest of all categories and ideal for families and friends traveling together. With three double rooms and three separate entrances, two living rooms, four bathrooms, a guest toilet, mini kitchen and two walk-in wardrobes, you will find everything your heart desires. The bathrooms are equipped with two sinks, bidet and a hair dryer. 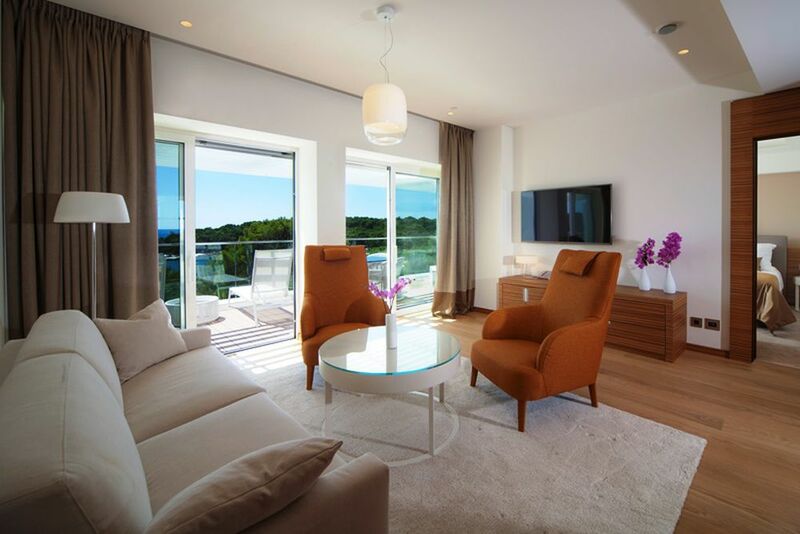 The highlight of the suite are the two Jacuzzis, sunbeds and sitting set on the terrace. Maximum of 8 adults. 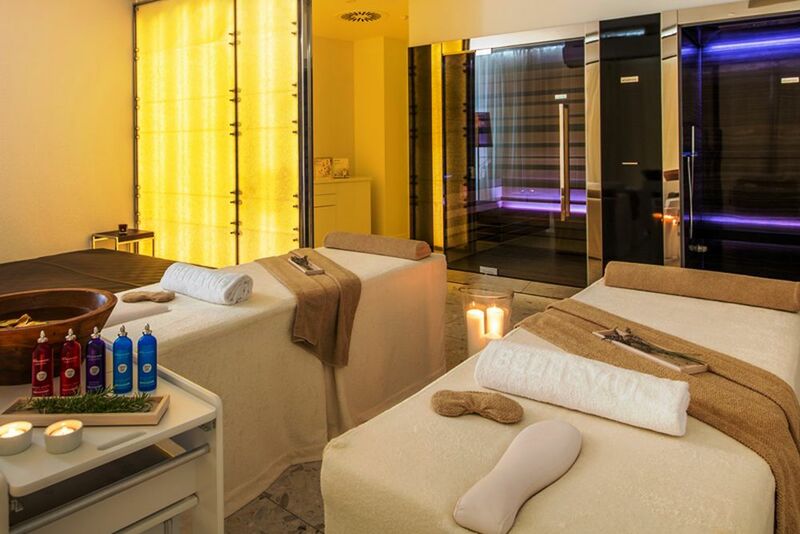 An oasis of relaxation can be found in the elegant and bright spa clinic. Come here and experience your own spa garden, the modernly equipped relaxation zone and the spacious seawater indoor and outdoor pools. Discover a new generation of spa services created in collaboration with nutrition and sports professionals and physicians. All cosmetic products used for body and facial care have been produced by leading international laboratories. Innovative treatments, such as the LCM (Light, Color, Movement), which harmonizes the body with the help of color and sound frequencies, immerse you in a new world of wellness treatments. In addition to a Finnish sauna, a bio sauna and a steam bath, the Spa & Relax Zone also features water beds with chromo therapy, cold water pools, heated stone beds and a relaxation corner for reading. The area around the hotel and Cikat Bay is ideal for cycling, running, trekking, hiking, Nordic walking and strolls in the fragrant forest. Explore the area on your own and experience the pleasantly shady pine forests. 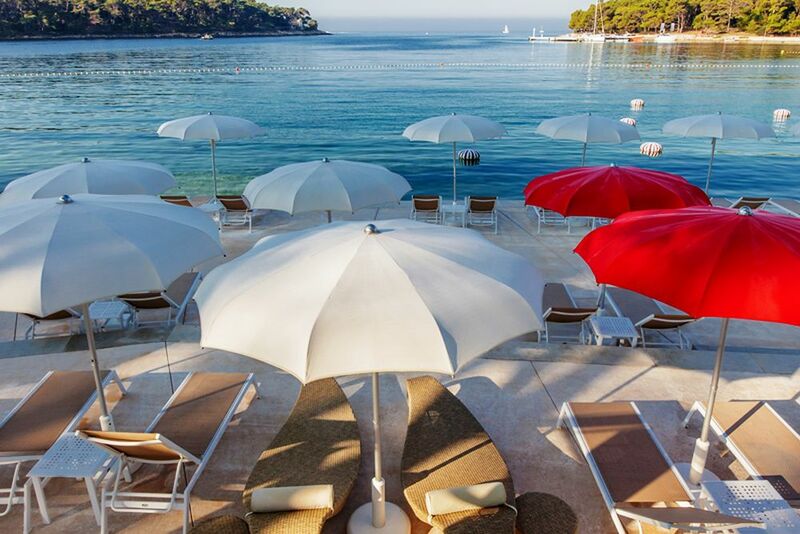 Near the hotel you will find tennis courts, football fields and water sports. The hotel spa offers a gym with air conditioning and state-of-the-art exercise equipment. 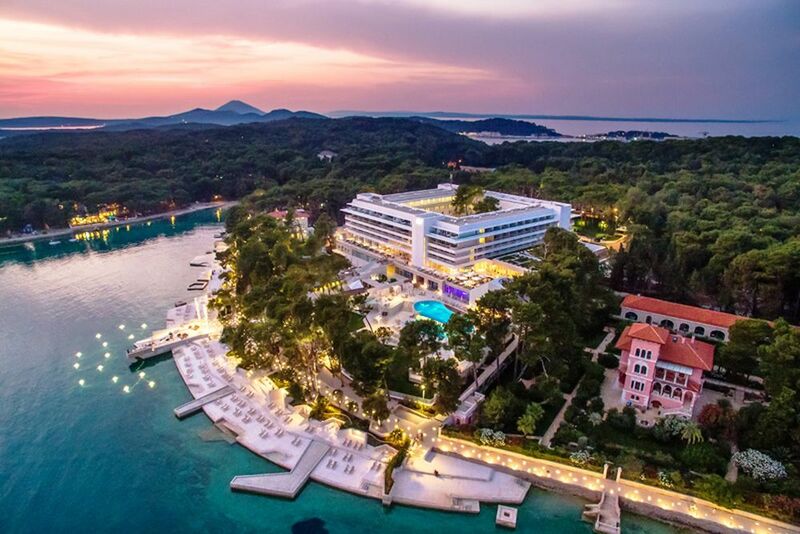 When booking half-board, you have the choice of where to have your dinner: in the Hotel Restaurant Alfred Keller or an à la carte dinner in the following restaurants: Borik, Veli Zal, Lanterna, Diana and Punta, Pin & Oil and Bava. When booking you will get more information about the individual restaurants. Please note that a table must be reserved at the hotel reception no later than 6 hours in advance.